The next morning we found out from the tourists we were just 20kms away from the Laguna Colorada. Also, I suddenly remembered I have to lower the tire pressure, so control and comfort was greatly improved. This last day was like a dream. Not only because of the riding improvement, but also for the views inside the national park that surrounded the Laguna Colorada: geysers, the lake, some birds etc. And at all times we were above 4800m altitude!!! The last incident was at night, when suddenly a sandstorm approached us. I remember I could see nothing and there was so much pain because I had the visor open. I had no other option than to drop the bike and wait at ground level for the storm to pass. In the end we got to some hostel to spend the night and the next day we crossed the border to Chile. Palomina emerged out of this experience with 30% less thread on the rear tire, a broken mirror, turn signal and some minor issues at the rear rack. One should imagine how happy we were to see asphalt again! This is what we know now. Before, having no idea about how harsh it will be, we thought there will be no problem. But with a motorcycle weighing 400kg with pax and luggage and with 50-50 tires it is not that easy. I think we fall over 100 times during one day. Also, we had no working GPS (it stopped working while waiting in Nazca) so we had to rely on the map and compass (but how useful might be a map in the desert?). The only orientation we had was some tracks in the sand and compass to guess where the tracks might be leading. Speed was very low, usually bellow 20km/h. Since the total length of the portion with no roads is over 500km, we had to spend a few nights. First night we were lucky enough to find San Pedro, a small village close to Salar Uyuni (in the second pic you can see how we refueled). But when the dark came during the second day, we were nowhere near shelter, had no idea how far away from Laguna Colorada and whether the heading was good. Gasoline was depleting fast. So we decided to camp, close to a big rock. Our tent is a three season type and given the high altitude (over 3600m) the temperatures dropped bellow zero during night. We had to remove the clothing and stay close one to each other and under the sleeping bag in order to conserve heat. The next day some tourists came with their guide to see the rocks and we got directions. After this, Laura said she wants to never see sand again. I think it was just challenging :). Salar de Uyuni is the world’s largest salt flat and a major tourist attraction in Bolivia. It measures around 200km from East to West and at most 100km from North to South. There are no marked roads, for orientation you have to follow the tracks, as long as you guess the approximate direction. There are some salt mining sites, two or three salt hotels and also some islands. 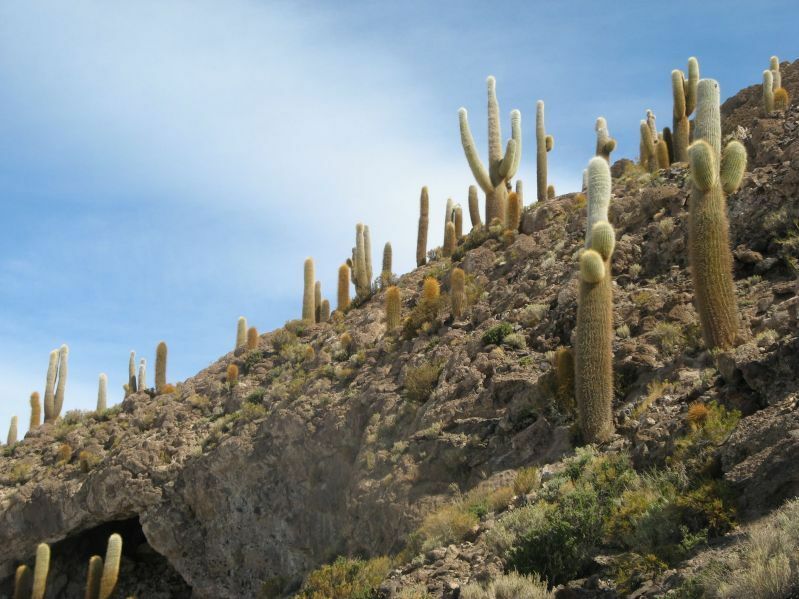 These islands are famous for the giant cactus that grows there. Very close to Uyuni there is a train cemetery. The dry climate is ideal for preservation, however many of them are cut in pieces and rusted. Unfortunately, even though this site is featured on all tourist maps, you have to drive/ride through mountains of trash in order to see it. See the whole story here.